New Blake Documents: Job, Oedipus, and the Songs of Innocence and of Experience1↤ 1 The materials exhibited here were discovered and recorded by Mark Abley in 1982 and 1983 and generously shared with G. E. Bentley, Jr., in September 1986; they have been organized and made into the present essay by GEB. We should like to dedicate this essay to our friend Joan Linnell Ivimy in thanks for her friendship to each of us over many years. The manuscripts are quoted here by her permission. Mark Abley and G. E. Bentley, Jr. Contemporary documents of William Blake’s life are widely scattered, in record offices, museums, churches, and libraries from London to San Marino and Melbourne. However, one of the richest collections of such materials is in a cottage called Apple Thatch in Hampshire among the voluminous papers of Blake’s last great patron, the artist John Linnell. This extraordinarily rich cache of manuscripts has wonderful materials not only for John Linnell and William Blake but for many others as well, such as Samuel Palmer and William Butler Yeats. Scholars with many goals have been welcomed, and often fed, housed, and entertained, by the splendidly generous custodian of these papers, John Linnell’s great granddaughter Joan Linnell Ivimy. The pages of Blake Records (1969), which attempted to gather all contemporary references to Blake, are thickly strewn with references to the Ivimy Manuscripts, particularly in the parts recording the last ten years of Blake’s life. When I first went through the Ivimy mss. in 1959, it quickly became apparent that I could not possibly read the majority of them without devoting more years to the undertaking than I had weeks to spare. Consequently, I read with care everything I could find which related directly to Blake and to his known acquaintances during his lifetime (1757-1827); I read almost equally scrupulously everything for the period from his death in 1827 to that of his wife in 1831. For the period after 1863, I read much more casually and rarely did more than glance at letters unless they were to or from someone important to Blake, such as Anne Gilchrist or Samuel Palmer. I concluded my search, confident that I had found most of the Blake references there and that more were awaiting searchers with sharper eyes and more patience and time than I could muster. 1. 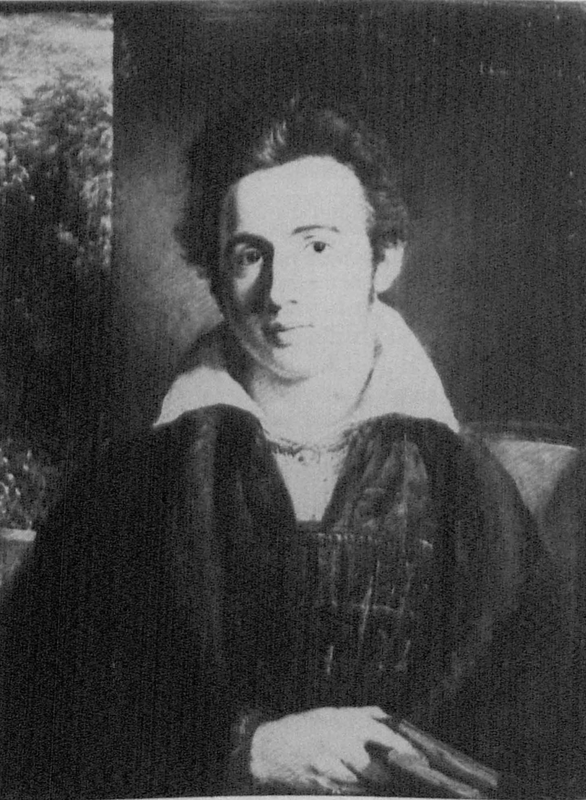 John Linnell’s oil portrait (dated “1821”) of Edward Denny (then age 25) in the collection of Robyn Denny, and reproduced with permission of Robyn Denny. But the collection kept growing, with the discovery of here a trunk of Linnell manuscripts which had lain unrecognized for decades in the vaults of a family lawyer and there the return of letters from other members of the family. In the past twenty-seven years, I have returned repeatedly to Apple Thatch and to the loving hospitality of Joan Linnell Ivimy, and I have often found more references to Blake. In 1982 and 1983, Mark Abley, formerly a Rhodes Scholar at Oxford and now a successful Canadian journalist, called by arrangement at Apple Thatch in search of letters of William Butler Yeats and documents relating to Samuel Palmer. He was welcomed with her customary generosity by Joan Linnell Ivimy, and indeed Mark Abley stayed for some time at Apple Thatch. During his stay, he found not only manuscripts relating to William Butler Yeats and Samuel Palmer, which were partly for the Oxford edition of Yeats’s letters and partly for Mark Abley’s own Parting Light: Selected Writings of Samuel Palmer (1985); he also found a number of references to William Blake which were not recorded in Blake Records (1969) or William Blake: The Critical Heritage (1975). A number of these references to Blake I had myself seen in the years since Blake Records went to press, and, by the time I met Mark Abley in September 1986, these were already incorporated in the Blake Records Supplement, which is now in press. Some of them, however, were quite new to me, among them some of the most interesting references to Blake. When The Parting Light was published, I discovered in it some Blake references (not from the Ivimy mss.) which were new to me, and when I wrote to Mark Abley, and subsequently met him in Toronto, he generously offered me the notes he had made of his discoveries among the Ivimy mss. for the Blake Records Supplement. Because of the remarkable interest of these Blake materials not already incorporated in the Blake Records Supplement, I thought it desirable to make them into a separate article, to which Mark Abley generously agreed. when you see Mr. Blake be so kind as to tell him to keep the drawings he is making for me, when they are finished, till he either sees or hears from me— . . . This is the first known reference to a direct connection between Blake and Denny, but it is plain that already Denny was an admirer of Blake. Unfortunately, we do not know what drawings Blake was making for Denny in 1821, for Denny is not known to have owned any drawings by Blake.3↤ 3 According to the index to Martin Butlin’s magisterial Paintings and Drawings of William Blake (1981). Through Linnell, Denny bought Blake’s Job engravings and Blair’s Grave with Blake’s designs (Blake Records , 335-36, 593). Apparently the drawings pleased Denny, for Denny purchased other Blake works in November 1826. A numerous audience was attracted yesterday evening to this theatre, by as barefaced an imposition as was ever practised on a public audience since the days of the bottle-conjuror. It was ostentatiously announced in the play-bills, and also in some of the public prints, that the Œdipus Tyrannus of Sophocles would be acted last night at this theatre, “being its first appearance these 2440 years”. Of course many persons, attracted by the accurate chronological knowledge of the supposed translator, went in the expectation of seeing the ancient tragedy stalking for once on modern boards . . . . In this expectation, which the numerous translations of the Œdipus Tyrannus into English prose and verse did not render altogether unfounded, they were most miserable disappointed; for instead of listening to the simple yet majestic strains of Sophocles, they were indulged with a cut-down edition of the bombastic yet powerful tragedy of Lee and Dryden upon the same subject. That piece, which must always affect an audience very strongly, certainly has made its appearance on the stage within the last 2440 years . . . . The tragedy, in spite of “being its first appearance for these last 2440 years”, was given out for repetition amidst thunders of applause, which we expect the play-bills of today will inform us proceeded from an audience, distinguished no less for its numbers and its fashion, than for its intelligence and discrimination. NEW ROYAL WEST LONDON THEATRE, Tottenham-street, Charlotte-street, Fitzroy-square. Œdipus Tyrannus, by Sophocles, revived after a lapse of 2440 years, and received (as at Athens) with shouts of applause. It will be repeated till further notice. THIS and every EVENING, ŒDIPUS. Œdipus, Mr. Huntley; Jocasta, Mrs. Glover. After which, THE WAGER LOST; in which Mrs. Glover will perform. Boxes 4s., pit 2s., gallery 1s. Private boxes for families may be had nightly. begin page 106 | ↑ back to top At least the date in this advertisement is two centuries less preposterous than that in the review. Blake was certainly familiar with Sophocles, for his “Philoctetes and Neoptolemus at Lemnos” (1812) was made nine years before from Sophocles’ Philoctetes,6↤ 6 Butlin (1981), #676. and his intimate friends John Flaxman and John Linnell4 were admirers of Sophocles, and Flaxman had made designs from his plays. It is agreeable to find that Blake was “much entertained” by the performance, even though the play he saw was some two thousand three hundred years younger than it was advertised to be. Lady Stafford will not be here for a month so I have not been able to put before her Ladyship Blake’s Etchings, and I fear I shall not be able to get subscribers as many of my friends who have seen them, have only made the remark that they were striking but extravagant and not one has yet expressed a desire to buy, but I will omit no opportunity of shewing it whenever I meet with the One Man in a Thousand who understands Painting. Elizabeth Lady Stafford, the wealthy Countess of Sutherland in her own right, was married to the even wealthier George Grenville Leveson-Gower, Marquis of Stafford, who was famous as a politician and an improver of their huge estates (including most of the County of Sutherland). Both Lord and Lady Stafford were keenly interested in the arts; he was President of the British Institution, she was a painter in watercolors, and both collected art eagerly. A purchase from the Staffords might have led to important commissions for Linnell and perhaps to purchases of other works by Blake. However, if Lady Stafford was shown the Job engravings on her return to their home in Trentham, she apparently showed little interest in them, for her name does not appear in Linnell’s Job accounts. There are numerous letters from Edward Price to Linnell among the Ivimy mss., but he is not known to have had any other connection than this one with Blake. Clearly he was simply one of many acquaintances through whom Linnell tried to sell copies of Blake’s Job. Linnell had become a profound admirer of “the begin page 107 | ↑ back to top dear kind and accomplished Lady Torrens,” and in 1820 he painted an admirable portrait of her with her six children.11↤ 11 It is reproduced in color in Katharine Crouan’s catalogue of John Linnell (1982), #75. In April 1826 he sold a copy of Blake’s Job to her,12↤ 12 Blake Records, 590, 599. and on 19 December 1832 her son A. W. Torrens, a captain in the Grenadier Guards, asked Linnell to send “by the bearer the ‘Book of Job,’ as you kindly promised to do.”13↤ 13 William Blake: The Critical Heritage (1975), 226. He apparently admired but did not buy Blake’s Job, and three years later he wrote again to Linnell: ↤ 14 Of course neither Arthur Torrens nor his wife appears in the records of payments for Job, since the copy they received was a gift. I received the book of Job, & return you many thanks for the present, in the name of my wife.14—The note you were so good as to send with it, is no mean part of the value of the gift, containing as it does from so eminent an artist such strong approbation of the copy which was inadvertently left in the book . . . .
Clearly the Denny and Torrens families were appreciative patrons of William Blake. If only we had records of the rest of their dealings with and opinions of him. These are so far the last of the records of Blake’s life and works to be discovered among the Ivimy mss., but it seems likely that yet more will be found in that rich respository. Few discoveries, however, are likely to be so intriguing as the view given here of Blake sitting between his friends John Varley and John Linnell in a box in a little theatre in Westminster being “much entertained” by a performance of Oedipus advertised as having been written in 619 BC by Sophocles (496-406 BC) but in fact written by Dryden and Lee and first acted in 1678.